It could be used to explore virtual museums, like the "Virtual Guggenheim"
LONDON, England (CNN) -- You're walking along a street in Roman Pompeii at the start of the first millennium when you notice a spectacular stone building. You reach out towards it and your guide informs you it's a temple to the god Jupiter, built in 200 BC. With a flick of your wrist you save the data and, school assignment complete, you step out of your Cocoon and back into your living room. 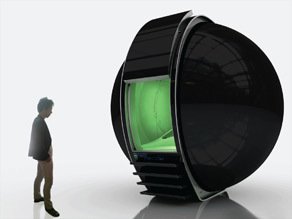 The Immersive Cocoon could revolutionize the way we interact with computers. Educational historical journeys are just one possible use of the Immersive Cocoon, a walk-in virtual-reality pod being developed by NAU, an international design collective that aims to revolutionize the way we interact with computers. Videogame players will immediately recognize the Cocoon's gaming potential. The motion-tracking cameras and wrap-around visuals could make for an incredibly realistic gaming experience, where you use your whole body to fight off enemies who approach from all directions. But the Cocoon's potential extends far beyond gaming. Imagine having a Cocoon in your home, connected to the Internet. Its unique interface means that rather than inputing commands with a keyboard or a moving a cursor with a mouse, you can simply reach out and 'grab' information from all around you. If that sounds like science fiction, it may be because the 3D motion-tracking system was originally developed by John Underkoffler, whose work at Massachusetts Institute of Technology inspired similar 'reach out and grab' technology in the sci-fi movie "Minority Report." NAU sees the technology as part of a trend away from traditional interfaces towards more intuitive ways of interacting with technology, a trend they say has already begun with existing mainstream devices such as the motion-sensitive controls of Nintendo's Wii gaming system or the touch-sensitive display on the iPhone. Schaedler says the Cocoon could re-shape our working environments, allowing home working and virtual meetings where you could talk with virtual versions of your co-workers in detailed virtual environments. He also envisages enhanced online shopping, with Web sites offering 3D shopping environments. "Imagine Amazon.com being fully 3D. We could walk through a 3D space where you have all the books lined up, and you could walk right up to a book," he says. Virtual shoppers might be able to take books off their shelves and read a sample, or even ask other virtual customers for recommendations. The Cocoon also could be the perfect medium for interacting with virtual public spaces -- 3D renderings of libraries, museums and art galleries that can be visited online. Blazing a trail in the development of these spaces are New York architects Asymptote, who developed the New York Stock Exchange's 3D trading floor and have designed a virtual Guggenheim Museum. Asymptote co-founder Hani Rashid explained to CNN that the Guggenheim Museum wanted its artworks to be viewable via the Internet. But rather than use a standard web site layout, the Guggenheim wanted to create a virtual space as striking as the architecture of its New York museum. Asymptote came up with a futuristic design that Rashid describes as "a perfect hybrid of electronic space and physical space." Although the project is currently on hold, it offers a tantalizing glimpse of a future in which virtual spaces are designed with the same attention to detail as real physical buildings. Rashid and Schaedler are a new breed of architect who are as comfortable in the virtual world as the physical, and they agree that as the Internet develops into a 3D medium, it will be architects who design the interactive virtual spaces. Rashid says, "Ultimately, architects think spatially and where there's a spatial issue we're the ones trained historically to figure out how to make people understand and feel the emotional, physical and artistic side of a space." NAU hopes to complete its prototype Cocoon by October 2009, with models commercially available by 2014. Initially, it's intended to be used in public spaces or to be leased by companies, until the technology becomes cheap enough for the consumer market. But where NAU are creating an escape from the real world, others are working on ways of merging virtual information with the real world. Scott Fisher is the Chair of the Interactive Media Division at the University of Southern California. In the 1980s he helped develop the archetypal 'glove and goggles' virtual reality system at NASA's Ames Research Center. Since then he has worked with Japanese mobile communications giant NTT Docomo on a kind of technology known as "augmented reality." Where virtual reality immerses you in an artificial world, augmented reality lets you go about your normal life, seeing the real world with additional information superimposed on it. "You might be walking down a street in Tokyo and you could see information about a restaurant that you're walking by, or you might walk by a store and see information about what's on sale there," explains Fisher. This kind of technology has been used for years in pilots' heads-up displays, but a personal augmented reality system requires some sort of portable display, such as a headset. Prototype headsets were once cumbersome things you wouldn't want to wear in public, but modern designs are moving towards something resembling a regular pair of glasses and researchers are working on incorporating the technology into cell phones. Fisher says "This kind of augmented reality is still pretty much in the research stage, but there are a few companies that are about to start marketing, so we'll see things coming out commercially in the next few years." Whether our future reality turns out to be virtual or augmented, it certainly promises to be interesting.